Rustic, very private farm style cottage overlooking the Franschhoek river. 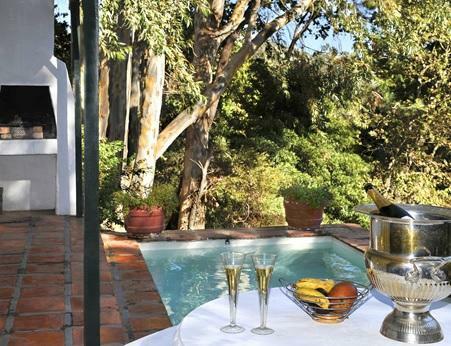 Private plunge pool with deck and braai facilities lovely fireplace in the lounge kitchen area. Fully equipped kitchen, Queen bed, lovely linen, extra blankets for the winter months. Panel heater and ceiling fan in bedroom. En-suite bathroom, bath towels, hand towels, soap, toilet paper supplied. Shower in bath. Approximately 10 minutes walk to centre of village, two minutes driver close to awesome wine farms and award winning restaurants.